Blue fashion is one of the hottest makeup trends in vogue these days which has given a very wild and unique touch to the beauty looks. The ocean of different shades of blue color has enlivened the trendy summer looks of women who have wholeheartedly welcomed this fantastic trend of color to have a change of looks and approach in the art of makeup. Blue lips are some of the hottest fashion trends in lipsticks these days which tend to explore some very creative ways of adorning the simple and plain looks of lipsticks. The trend is definitely inspiring and attractive and a fun filled way to look gorgeous and different. Blue lips beauty trends on the fashion ramps have laid the ways and provided the tips that can really offer you diverse methods of having the blue look that can be molded to suit any type of formal and causal fashion impressions. One of the simple looks is the plain matt application whose appeal can be enhanced by adding gloss to give it extra shine. However, since simplicity is no more the talk of the town there are many artistic approaches which have been fused in the trends of the blue lips to make them more thrilling and fun to try. The sugar blue lips is one of the very sweet looks in the blue lips that has a coat of crystals that gives an impression of icing sugar. Ranging from the very light aqua shades to the deep navy blue shades, you can make them pair up with any hot summer outfit you want and carry a sweet and tempting kissy look all day long. 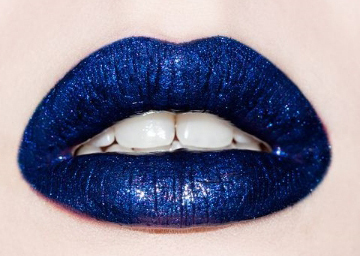 The sparkle lips are also another charming style of the blue fashion makeup trends in lipsticks which makes use of larger crystals on a shiny and glossy base of blue lipstick. The result is a dazzling grace that instantly attracts the attention. Depending upon the look you want to flaunt, the use of matt and glossy textured lipsticks should be chosen judiciously. The gelled blue lips are again some of the shiny looks of the blue lipstick which tend to give an illusion of slime and are indeed a catchy sight that offers richness and fullness to the lips. 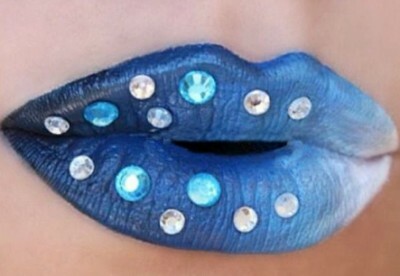 Another great art used in the beauty trends of blue lips fashion is that of painting. 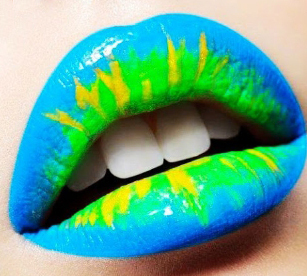 Many lips are painted with the dominant shade of blue and given printed patterns and animations to make it a groovy and exciting look of the smile. It can be a smart and fun way to get ready for a perfect summer trip to the beach. Be it any type of adornment you wish to make; this trend is open to all sorts of tampering.